Racing fans - start your engines and protect your furniture! 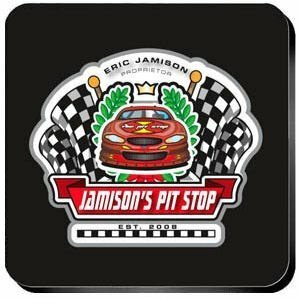 These fun coasters declare that your Pit Stop is ready to go. Full-color design features a bright red race car surrounded by several checkered flags to show who is the champion proprietor of this pit stop. Personalized with the information you provide at checkout: first and last name of the owner and the year the pit stop was established.